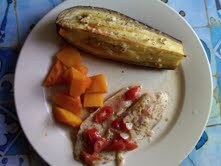 I made an amazing lunch yesterday; it was yummy, filling, and healthy! 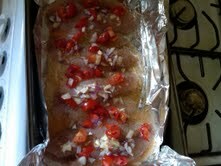 When I cook fish, I love to bake it with some sort of lime/lemon mixture…the flavours are amazing. Also, most people think eggplant is pure mush, but I bake my eggplant until its just barely cooked…that way it retains its shape and texture. And anyone that knows me, knows I love butternut squash…even steamed, its good. 1 – Rinse talapia with water and lime juice then season with salt and pepper (and whatever else you want). 2 – Dice onion, garlic, tomato. Put in a bowl and squeeze lime and add about 2 teaspoons of olive oil and mix (the longer you let this sit, the better). 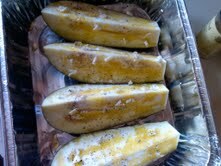 4 – Take a whole eggplant and cut length-wise into quarters. In a bowl mix 2 tablespoons of olive oil and garlic and spoon mixture over the eggplant then sprinkle with seasalt and ground pepper. 5 – Put the talapia into the oven and bake for 35-40 minutes (the flesh will flake easily when done) and shove the eggplant under the broiler. Bake the eggplant for about 20ish minutes. It’ll look like it cooked but it won’t be super-soft. 6 – I simply steamed the butternut squash. No salt, oil, nothing.